Cap: 19 (20, 21)” (48 51, 53 cm) in circumference at band and 9.5 (10, 10)” (24 25.5, 25.5 cm) tall unstretched. 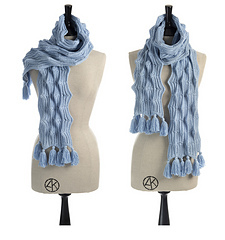 Scarf: 53 (57, 65)” (135 145, 165 cm) long and 6 (9, 9)” (15 23, 23 cm) wide without tassels. Cap: Premier® Cotton Fair® (52% cotton, 48% acrylic; 317 yd 290 m/3.5 oz 100 g): 1 (1, 2) balls of #2703 baby blue. 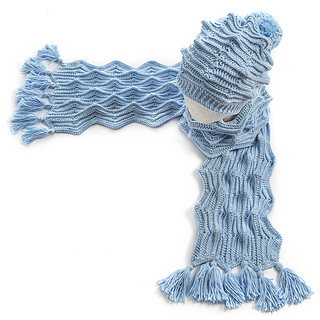 Scarf: Premier® Cotton Fair® (52% cotton, 48% acrylic; 317 yd 290 m/3.5 oz 100 g): 2 (3, 4) balls of #2703 baby blue. This eBook involves crochet skills only. 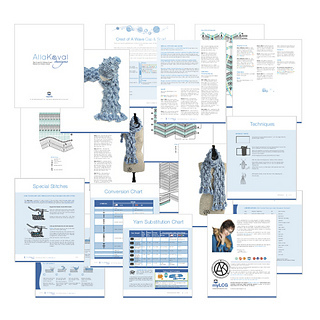 20 pages, 4 photos, 4 stitch diagrams, 4 tutorials: How to Crochet into 3rd loop hdc, Reverse Single Crochet Stitch, Making a Tassel, Making a Pom Pom; technical pages: Glossary, Conversion charts, Yarn Substitution Chart.